For perfect nails and eye lash extensions go to Nailz By Design. Also available: French Acrylic Nails, Gel Nails. Overlays, Manicure, French Polish Finish, Buff And Polish, Repair/Replace, 'Nail Maintenance', Infills with Polish, Infills with Drill-French, Acrylic, Gel Infills. Acrylic Toenails & Gel, Eye Lash extensions, Infills. Infills and maintenance are most important, this should be done every two to three weeks in the first 6 to 8 weeks. As the nails grow, there is a gap between the acrylic and the cuticles. Natural oils of the skin and cuticle cause lifting, some medications and herbal remedies may also do this. If you injure your nails, please get your technician to examine them as soon as possible, early attention to damaged nails can prevent the above from happening. Any time you wish to remove your nails, consult your technician for advise on how to remove them correctly, or better still, make an appointment to have it done for you, thus avoiding irreparable damage to your own nails. Nails need to be removed about 3 to 4 times a year in order to avoid build up, so they look their best all the time. 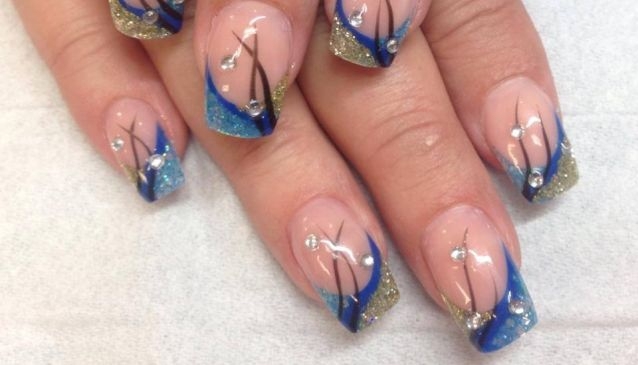 Nailz By Design, now specialises in very cool and unique nail art, which you won't find any where else in the Whitsundays.